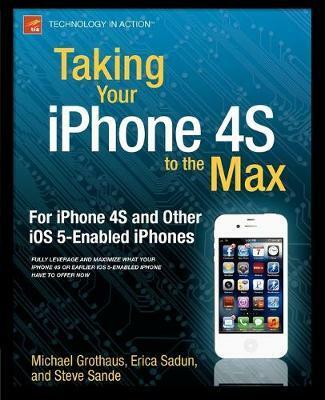 Unleash the power of your new iPhone 4S or other iOS 5-driven iPhone and take it to the limit using powerful tips and techniques from the Apple experts at TUAW, Erica Sadun, Steve Sande, and Michael Grothaus. Fast and fun to read, Taking Your iPhone 4S to the Max shows you how to get the most out of your iPhone using Apple's new iOS 5. Whether you're using the new iPhone 4S or earlier iPhone that runs the new iOS 5, you'll find all the best undocumented tricks, as well as the most efficient and enjoyable introduction to the iPhone available. Starting with an introduction to iPhone basics, you'll quickly discover the iPhone's hidden potential, like how to connect to a TV, use Voice Control using Siri, have video chats with FaceTime, and call friends overseas with low-cost VoIP. From the unified e-mail inbox and surfing the Web with Mobile Safari, exploring the world of social networking, using the multitasking capabilities of iOS 5, taking and editing photos, shopping for apps, media, and books, or just managing phone calls-you'll find it all in this book. You'll even learn tips on where to get the best iPhone accessories. Get ready to take your iPhone 4S and earlier running the new iOS 5 to the max! Illustrations note XV, 524 p.